Minimoonstar (Shackleton Remix) still holds up as an amazing track...Its one of those tracks that just leaves a lasting memory. I still remember the first time my friend played this in a DJ set. Villalobos + Shackleton, for me, these two producers are the most unique and talented of electronic music. They have their hits and misses but they can push boundaries and create and influence styles like nobody else in the business..
A very nice review of this record by Discogs user Dexterfeng and also a great review of this in Resident Advisor where the journalist said that the main track in this EP ''Minimoonstar is the closing track for a dance party under the Aurora Borealis''. Α very imaginative way to put it. And indeed Minimoonstar has such depth and spirituality. You get ''only'' 13 (!) minutes in the vinyl version, but the full 32 minutes can be found at PERL69CD and they work perfectly all the way. 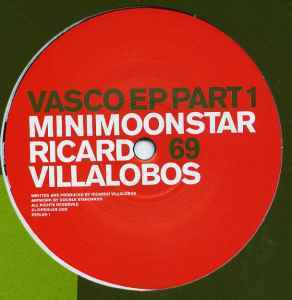 Minimoonstar is Ricardo Villalobos giving a masterclass on deep techno, a masterclass on arrangement and sound design. Exploring new possibilities in sounds and forms of electronic dance music, he is also combining them with an acoustic drum kit which seems to be played live through out the track - don't forget Ricardo has stated in an interview that he has studied percussion and why not possibly drums. These drums melts so beautifully with the modular-based bubbling deep beat and other synthesized sounds of the track in a way you never thought could sound so harmonious & beautiful. Staying true to his mission to combine the electronic and acoustic worlds, as he claimed many times before, he surely achieves that a lot in this record. But the bass line in this track is truly next level. Only with a large enough sub woofer or in a club could one understand the precision and detail of the bass which reaches into the lowest, almost pre-subsonic depths. Truly a marvelous piece of electronica, is like Ricardo saying to all of us, ''here you go, that's how diverse and fresh techno can sound by the end of the 2000's''. Which clueless journalist said a while ago that his best records are already behind him?? Respect. Getting back to "normal" and moving away from the groover lost in a tangent and looped for miles efforts of his Sei Es Drum releases, we find Ricardo dipping his feet in deeper territories which still come up strange, stretched and reserved only for the strong willed who have the knowledge and ability to program their sets. Music like this can go either of two ways in session. With a weaker dj who isn't up to the task of using such devices, they will be boring beyond imagination. In the hands of a dj who is capable and can program and knows a record has a beginning, a middle and an end. They will send you reeling and cascading off the walls in excitement. Ironically or probably not. The shortest tracks on this release are the remixes. Shackleton provides what we've come to expect from him and the San Proper mix is the mix that weaker dj's will wind up using from this release as it's about as straight forward a mix as it can be given the source material.